Hello there! 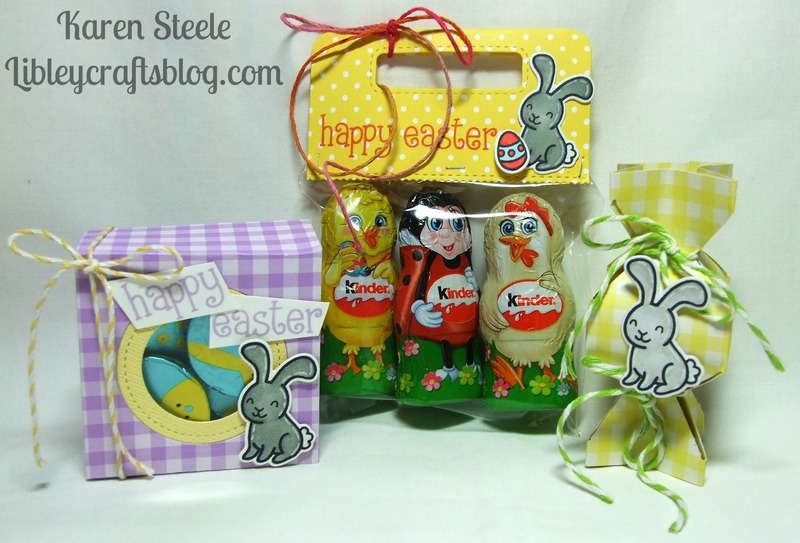 Today I’m sharing some cute little Easter treat bags and boxes with you – am I prepared or what?!!! I have made multiples of some of these designs for my son’s teacher and teaching assistants. I really like the sweet tote above and the scalloped treat box above that – it’s quite surprising what goodies you can fit in them! 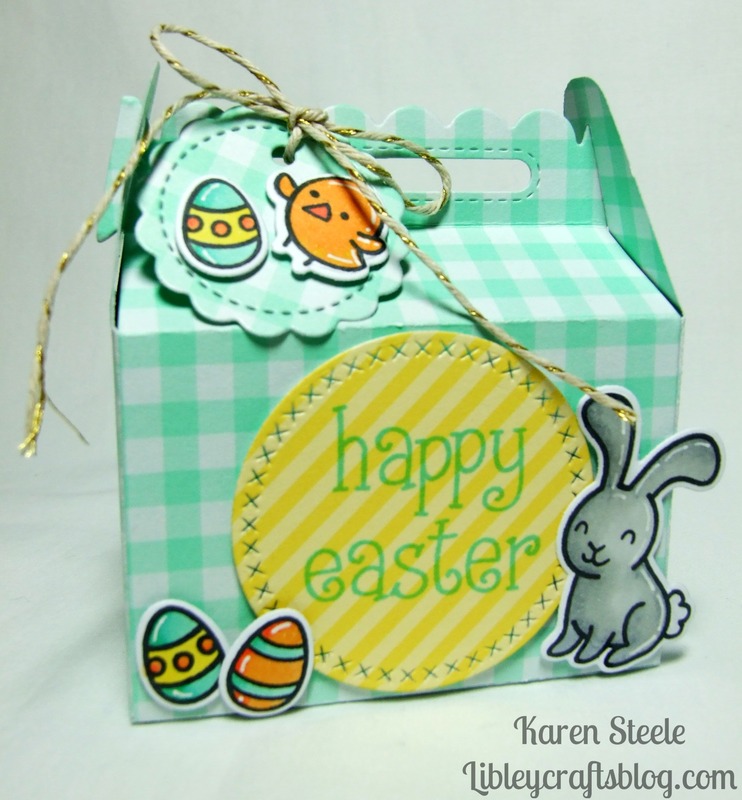 Supplies: Gingham cardstock from Create and Craft, Mama Elephant Treat Topper Die, WRMK Candy Box Punch Board, Reverse Confetti Tagged Tote Die and a box die that I got from ebay. 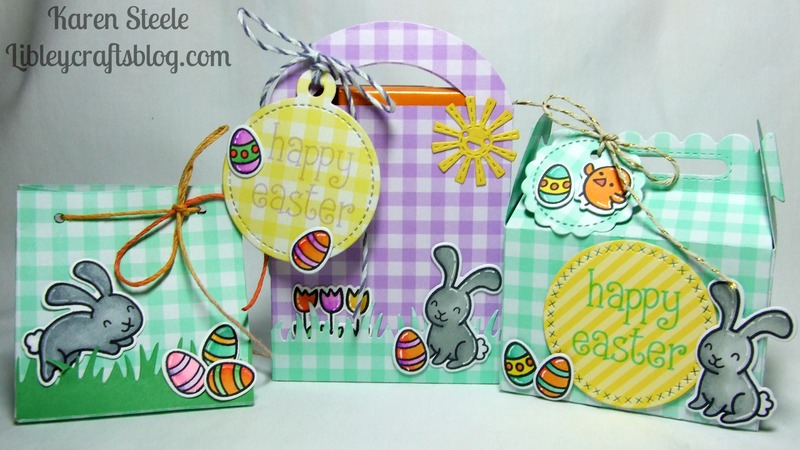 Also, the following products from Lawn Fawn – ‘Happy Easter’ stamps and dies, Scalloped Treat Box Die, Tiny Tags die, Stitched Circle Tag die, Large Cross Stitched Circle Stackables, Stitched Circle Die, ‘Make me Smile’ die, Grass Border die, Pink Lemonade Twine and Merman and Guava inkpads. I also used Spectrum Noirs, a Gelly Roll pen and the small L’il Inker sun die. Well, that’s all from me for today – and the foreseeable future. My blog has come up for renewal and I have decided that after 2 years, and after thinking about it for several months – not to carry on with it. There are a few reasons really. Time constraints are one of those reasons but to be honest my heart hasn’t been in it lately. I also have a couple of health issues that are being investigated at the moment – hopefully nothing serious but I think it would be a good time to finish now while everything is sorted out. I have kept my domain name so who knows I may have a change of heart after some time away and come back to my little blog space! I have ‘met’ some amazingly talented people in blogland and also some extremely kind people who visit my blog and leave such lovely comments. I want to say a HUGE THANK YOU to you all! Your support and encouragement have meant more to me than I can say 🙂 However – you won’t be getting rid of me altogether as I’ll still be following you and your wonderful blogs! Hello! 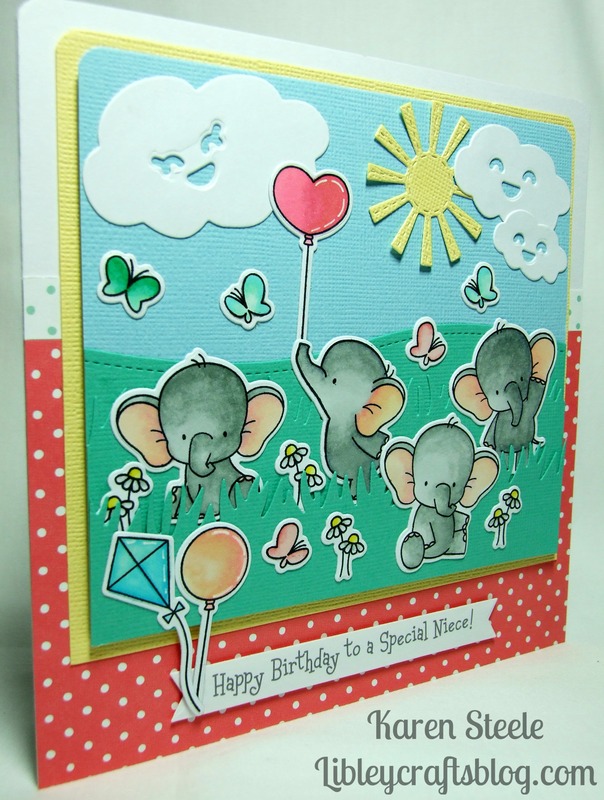 I am back today with this card that I have made for my sister’s niece who will be 9 next month. 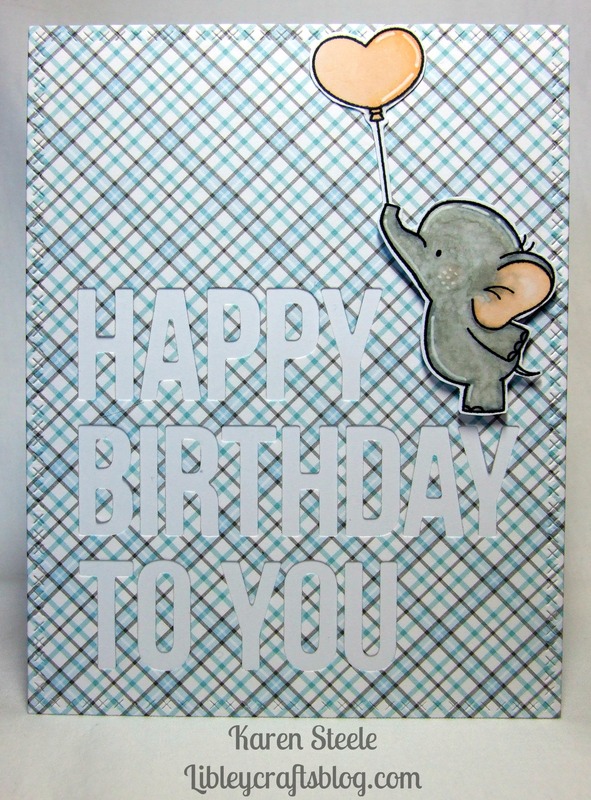 I’ve used the sweet ‘Adorable Elephants’ from My Favorite Things and I managed to get the die set too so it was so much easier to put his together without all the fussy cutting! Supplies: Every day Sentiments Banner Die – Lawn Fawn, L’il Inker sun die, Grassy Border die – Lawn Fawn, Stitched Scene Builder die – Frantic Stamper, American Crafts Pastel cardstock, MFT Cloud die, ‘Make me Smile’ – die from Lawn Fawn, Let’s Polka in the Meadow – Lawn Fawn and Spectrum Noirs. The polka dot paper looks red for some reason in these photo’s but it’s actually pink! It’s not the best day to be taking pics though as it’s so dark and gloomy – may be that’s got something to do with it! Hi! 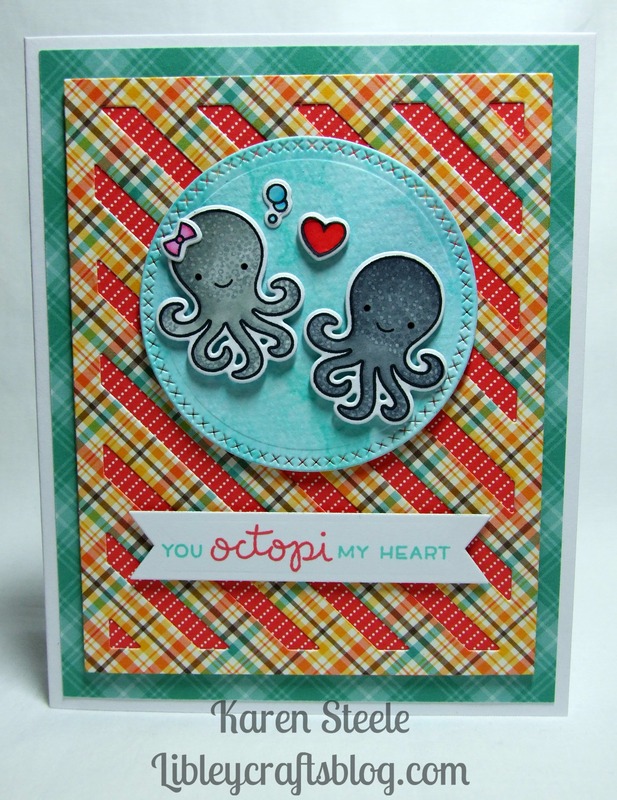 Here is the card that I have made for my husband for Valentine’s Day using Lawn Fawn’s cute ‘Octopi My Heart’ stamp and die sets. I coloured the octopi first then added lots of dots with the darker colour, then used a blender marker and dotted on top of them to give this effect. I have seen a few samples where this technique has been used and I really liked it so I thought I’d give it a go here! Other supplies used: Lawn Fawn Stripy Backdrop Die and Cross-Stitch Circle Die, Kaisercraft banner die, Spectrum Noirs and papers from Lawn Fawn – Perfectly Plaid Fall and Beachside. 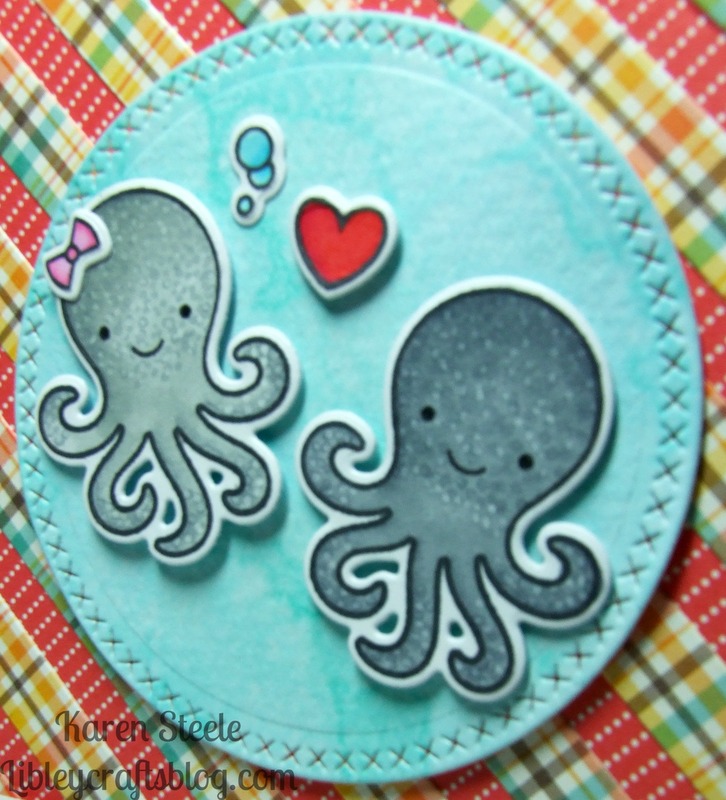 Also Lawn Fawn inkpads in Merman and Guava. 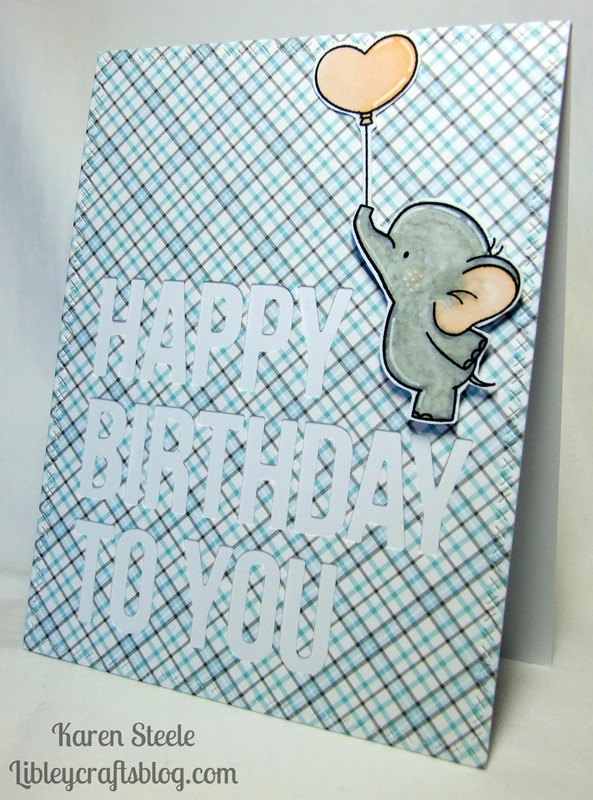 Happy Birthday Balloons and Stars…..
Hi there! 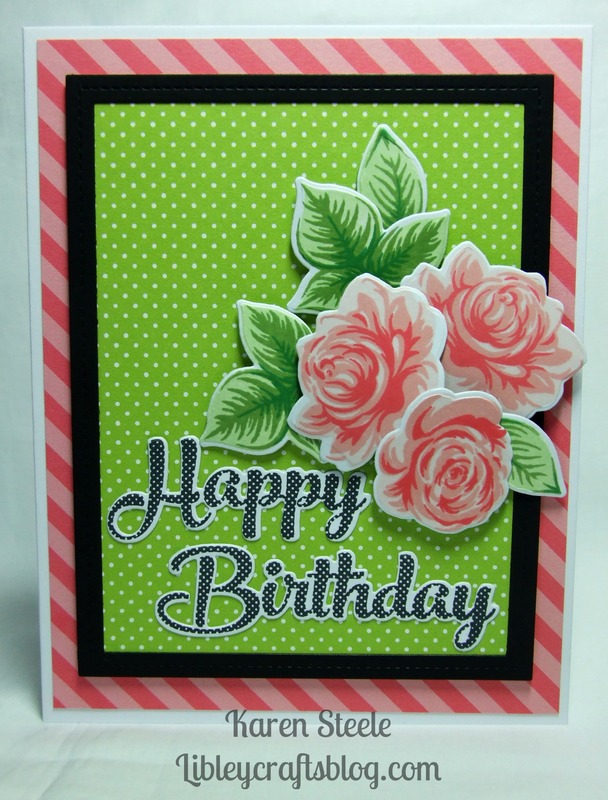 Another quick card from me today – I have used my new MFT Die-namics ‘Happy Birthday To You’ die here with papers and die-cuts from a collection called ‘Celebrations’ from Craftwork Cards. The twine is from Lawn Fawn as is the Cross-Stitched Rectangle die that I used for the star mat. Hello there! 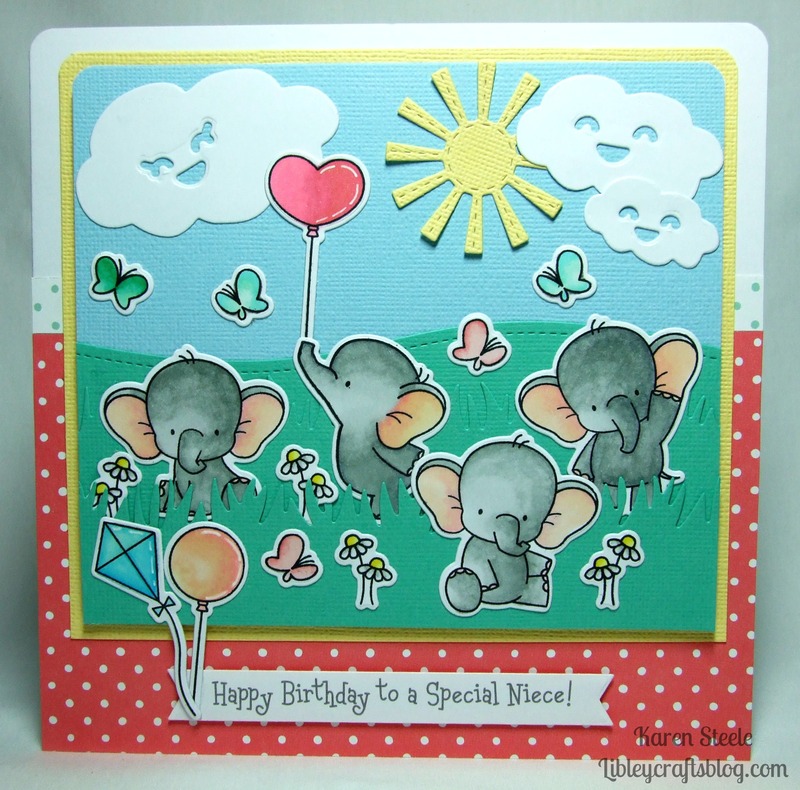 I’m back for a second visit this week with this quick card that I made using My Favorite Things ‘Adorable Elephants’ stamp set. I didn’t get the matching dies at the same time – which now I wish I had! Trouble is now I’ll have to wait until someone gets them back in stock! The greeting on here is also by MFT and is called (strangely enough!) Happy Birthday To You! This is one die that cuts all the letters out at once – or like I have done here, used the negative aspect. 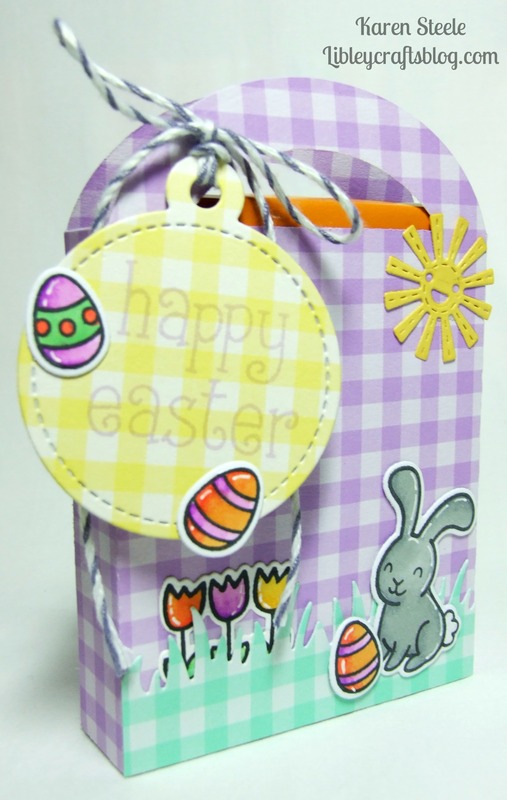 I think that I will be using this die a lot as it’s quite big so makes a good focal point on the front of a card. The patterned paper is by Lawn Fawn from their Perfectly Plaid Winter collection and I have also used the Cross Stitched Rectangle Die from them to cut it out with. I coloured this sweet elephant and his balloon with Spectrum Noirs. Hello! I hope you had a great weekend and are having a good start to the week. 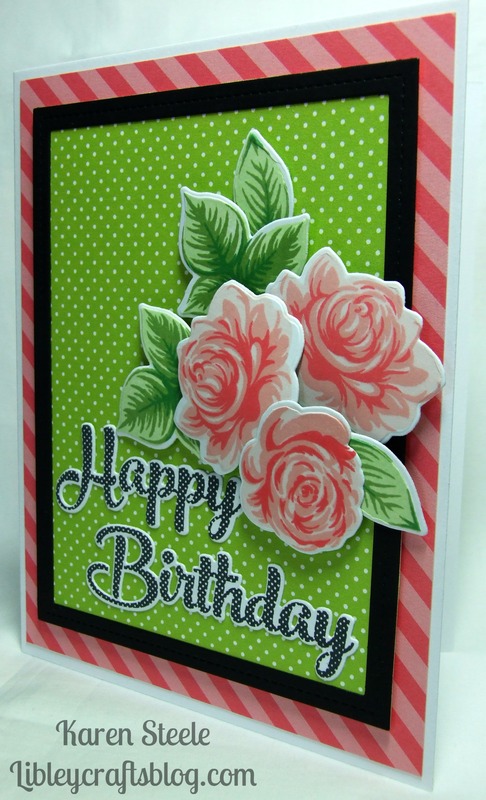 Today I’m sharing this card that I have made using Clearly Besotted’s English Rose stamps and dies and also the ‘Happy Birthday’ stamp and co-ordinating die. Clearly Besotted are on a break at the moment but will be re-opening in April. Other supplies used: Lawn Fawn – Let’s Polka in the Meadow (papers), Lawn Fawn – Stitched Rectangle Frame Dies. Memento inkpads in Tuxedo Black, Bamboo Leaves, New Sprout and Cottage Ivy. I also used Altenew’s Red Sunset set of inks. Hi there! 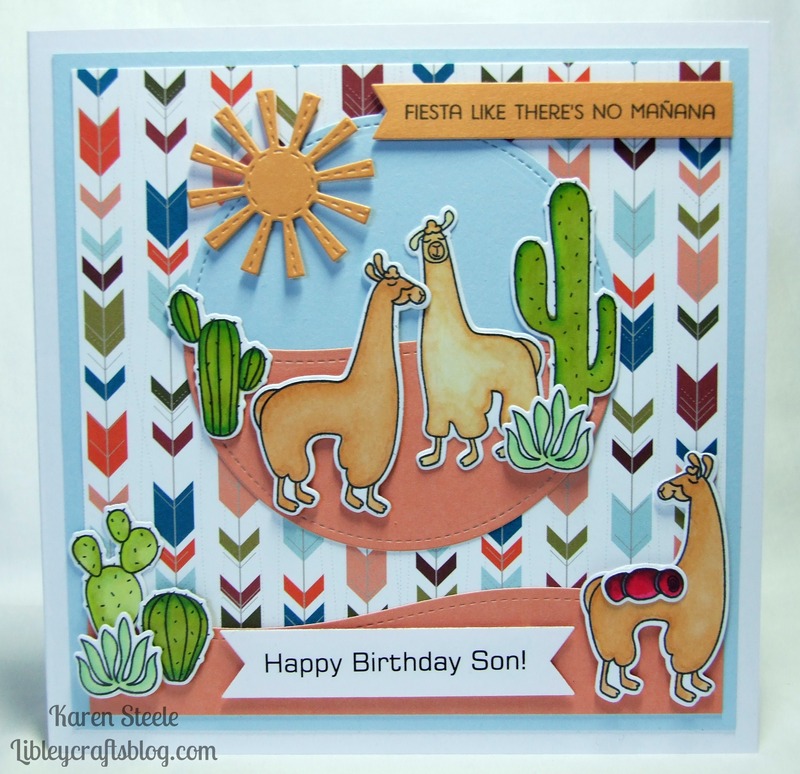 I have another card to share using MFT’s Llama Love stamps and dies – I’m getting my money’s worth from this set! 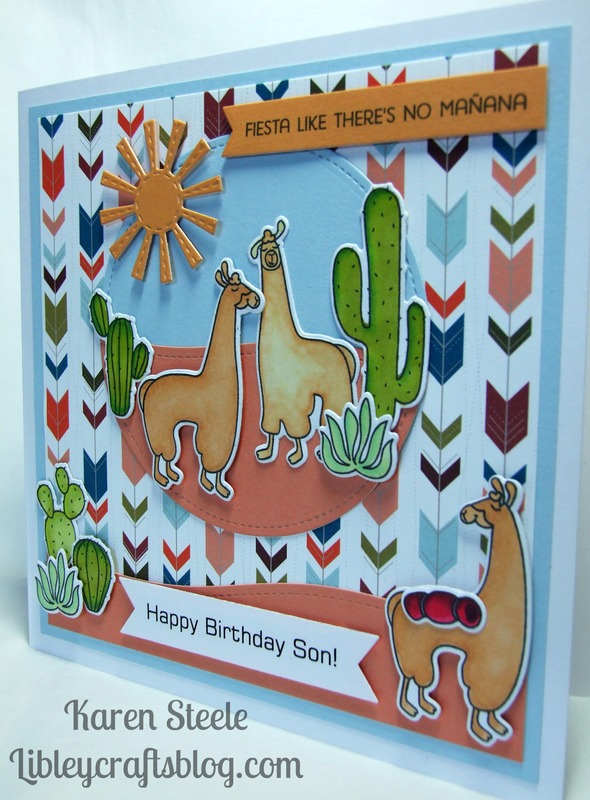 This is a card for my step-son who will be 24 years old next month – doesn’t seem five minutes ago since I first met him when he was 9!!! Other supplies used: MFT Free Spirit papers, L’il Inker sun die, Lawn Fawn Everyday Sentiment Banner Die, Kaisercraft Banner Die, Frantic Stamper Stitched Scene Builder dies and Spectrum Noirs. The plain cardstock is from my stash.